Here is the rack I am using. For back-ribs, these are really nice and meaty. 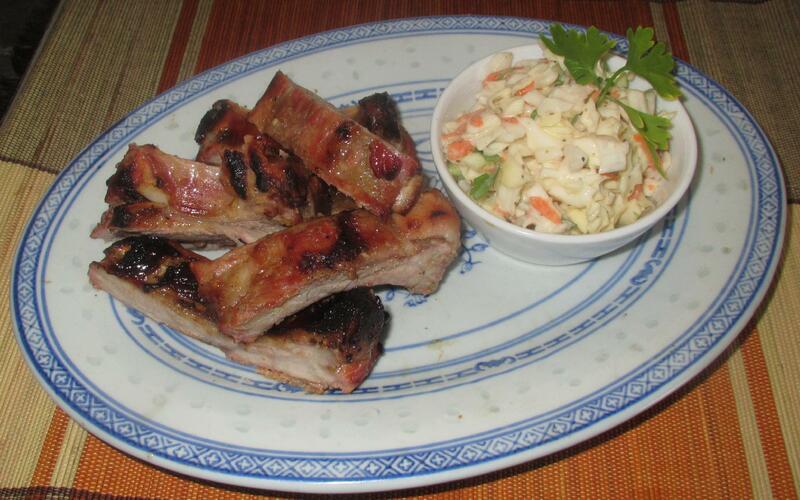 To prepare the ribs, you need to make cuts down between the bones to allow the marinade to penetrate. 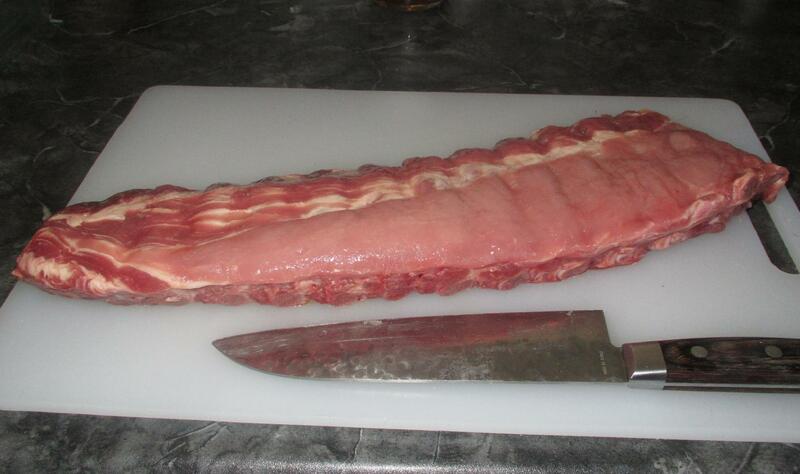 Don’t cut all the way through; just make shallow incisions about a quarter inch or so into the meat. Do this on the underside as well, but just cut deep enough to score through the membrane. Some people like to actually peel away the whole membrane but I don’t really think this is necessary myself. 1 large Jalapeno Pepper, thinly sliced. First, put the first 8 ingredients into the bowl of your food processor and whiz until it is well-blended. 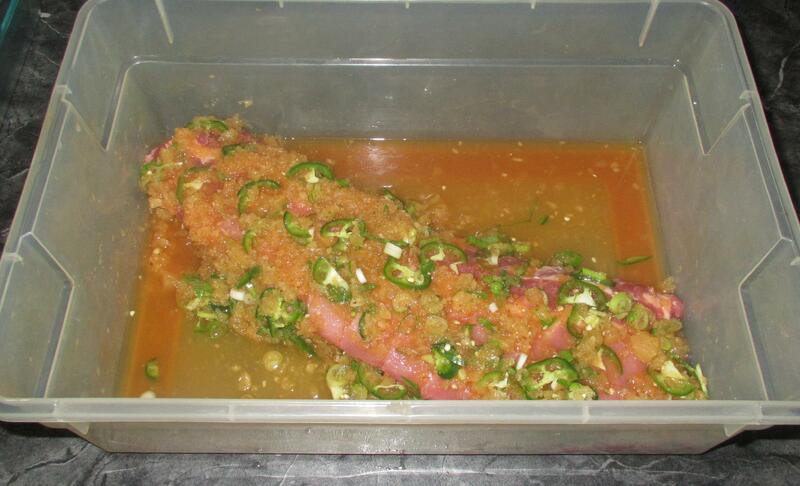 Now mix in the scallion and the Jalapeno slices and pour the mix over your ribs in a suitable container. Put them into the refrigerator or some other suitably cool location and allow to marinate overnight. 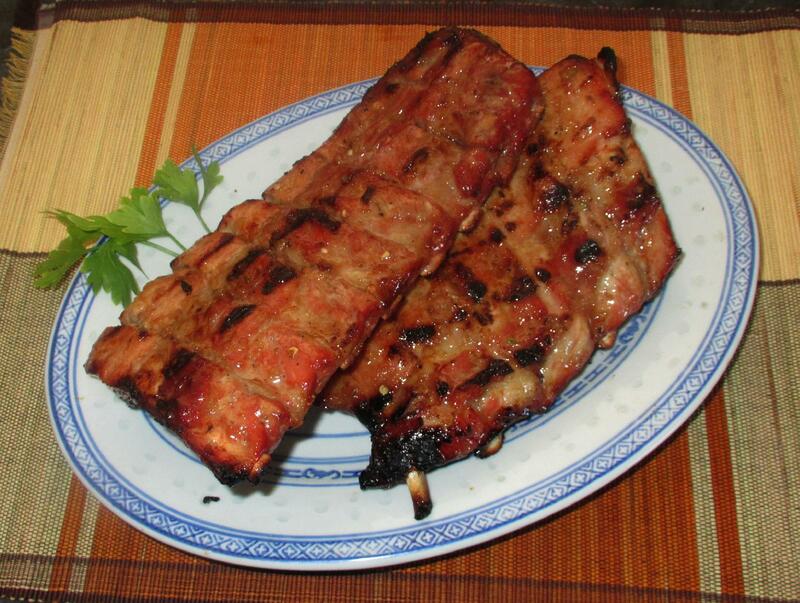 Depending on your container, you may wish to turn the ribs periodically to ensure all surfaces get time in the marinade. 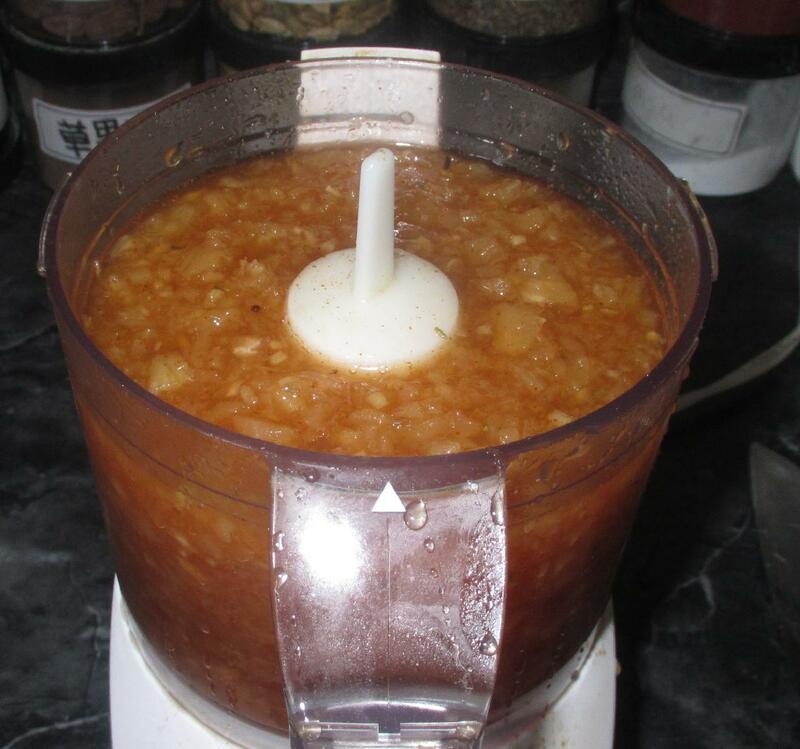 After marinating, remove the ribs and scrape away any solids and reserve about a half-cup or so of the liquid portion of the marinade in a bowl. 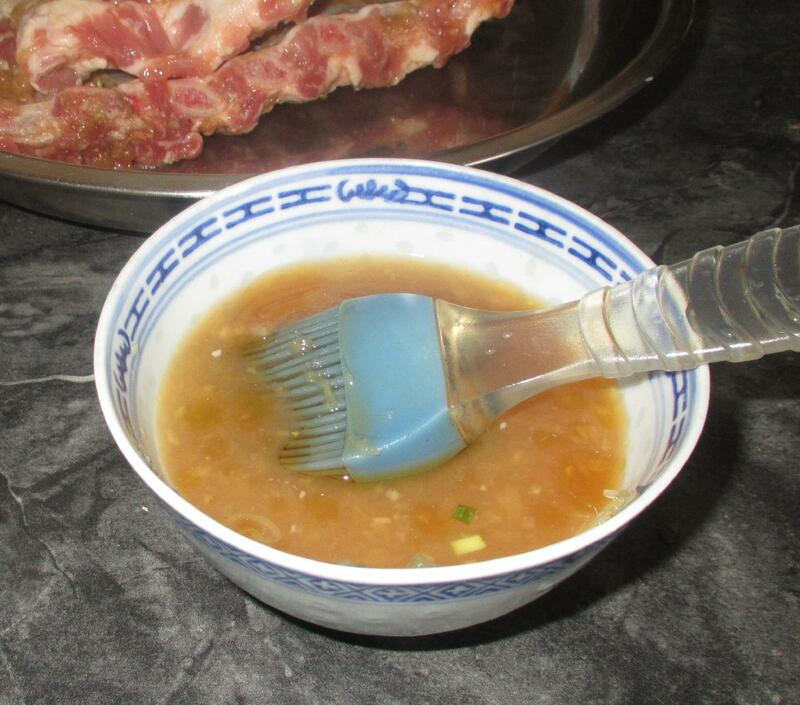 Stir in three or four tablespoons of sugar and a little oil to make a basting sauce. I had actually planned to include some sesame oil in the marinade but I forgot this and just added about a teaspoon to the basting mix. 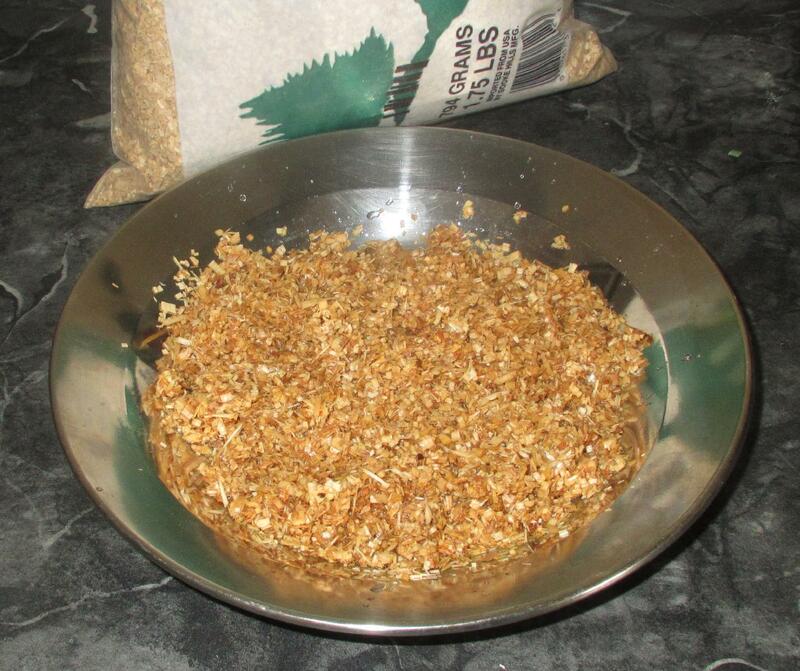 I am using hickory wood chips to make my smoke. Here there is about a cup or so which I soaked in water briefly so that they smoke more slowly. 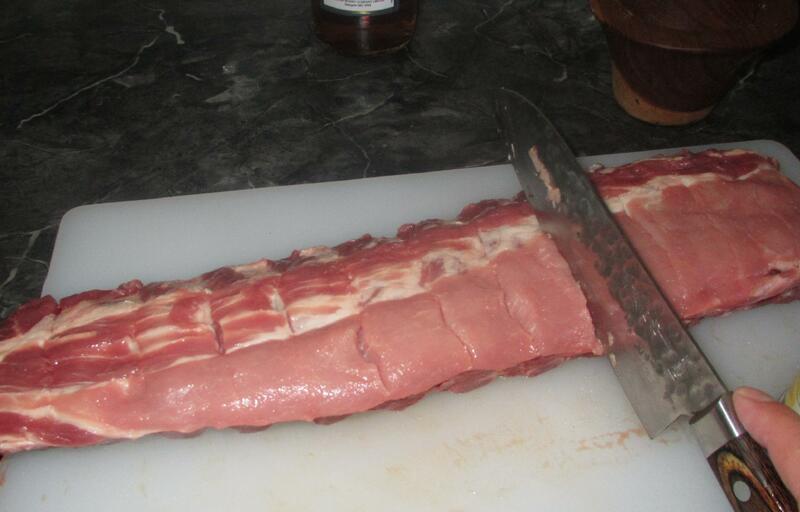 I have to apologize for the quality of the picture here but you can see the general layout for the preliminary cooking just after I placed the ribs. The woodchips are not smoking quite yet but I could already smell the aroma. As I am cooking by indirect method, the burner under the ribs is not on while the other two were turned to high until the woodchips started smoking and then were turned down so that I could maintain a heat of between 300 and 350 degrees. 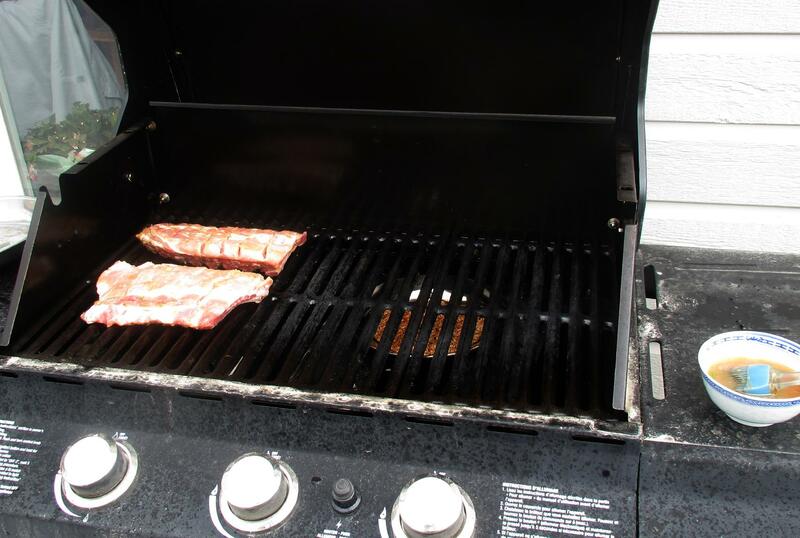 I cooked the ribs this way, basting periodically, for about an hour. For most people, longer would probably be preferred but, as I have mentioned in other posts, I like ribs cooked to the point before the meat actually starts to fall from the bone. 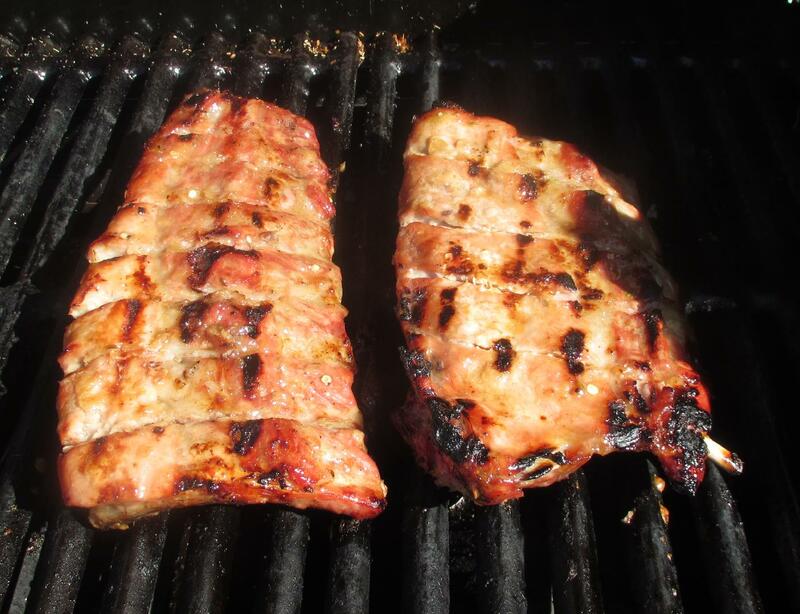 Once the ribs were cooked to tenderness, I moved them over to the hot part of the grill, turned up the flame and allowed some caramelization to occur, again basting several times during the process. Now… here is a little trick you may or may not have heard about. 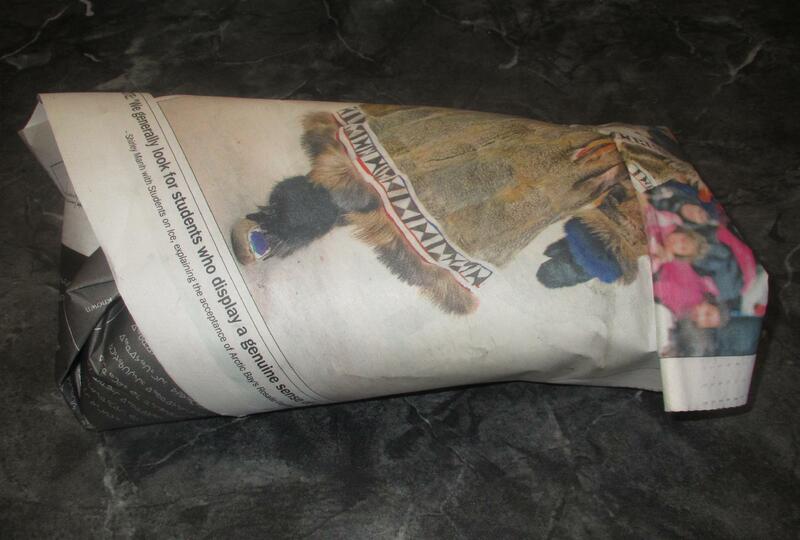 All grilled or roasted meat should rest for a little while before serving but with ribs you can improve the texture by wrapping tightly in foil and then putting them in a brown paper bag (or newspaper, as I have done here). You let them sit at room temperature for about 45 minutes to an hour so that the juices and flavorings will be drawn back into the meat making it more tasty and tender. The paper will insulate them so that they are still warm when it comes time to eat but, if that is not the case, just a few minutes in the oven can bring them back to temperature. I look forward to trying out a version of this recipe on my Big Green Egg BBQ. I will lblog and let you know how I get on. The particular cast can be hands-down typically the standout answer why this particular movie functions.